Artist Donghyun Son has opened up a new chapter in Oriental painting through a special melding of traditional Korean portrait techniques and mass cultural popular icons. His art show takes place from November 13 through December 20. Son has presented representations of popular character images such as Batman, Robocop, and Shrek in a Korean portrait style, and the logo type series created from the union of traditional Chinese character painting (a pictorial representation of Chinese characters making up the Confusion code of ethics) and logo brands such as Nike, Burger King, and Starbucks. 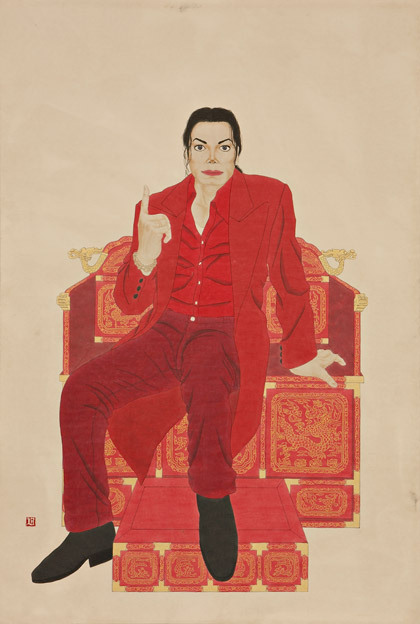 Unlike his previous work addressing each character, these recent works unfold a longer narrative with only portraits of Michael Jackson. Son seems to consider Michael Jackson a sole figure who represents a half-century history of mass culture from 1960 to 2000. 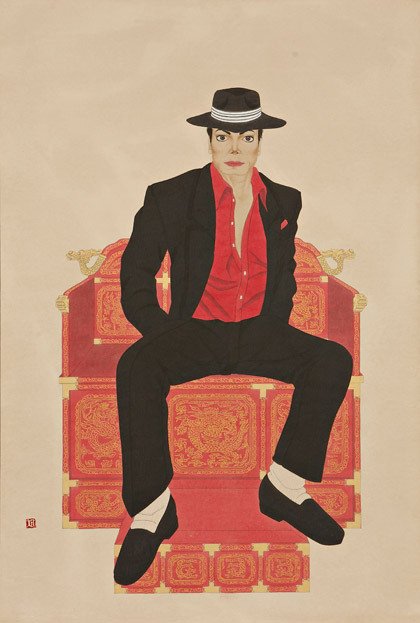 Jackson himself is a mirror reflecting an age and a living history, inspiring a new era. 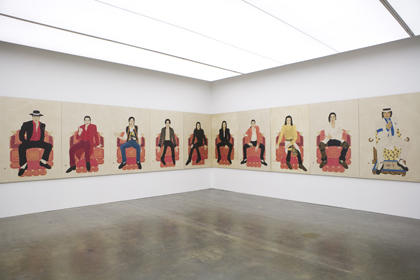 In KING series, the artist attempts a new change in many ways, employing new themes and subject matter. 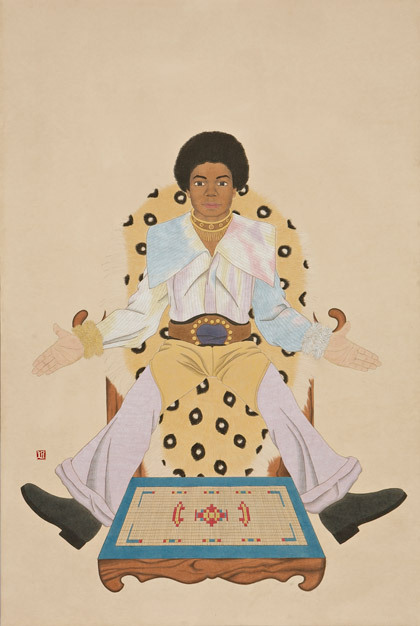 While in his previous work Son alluded to an irony in which the signifier clashes with the signified, in this series he highlights portraiture itself. 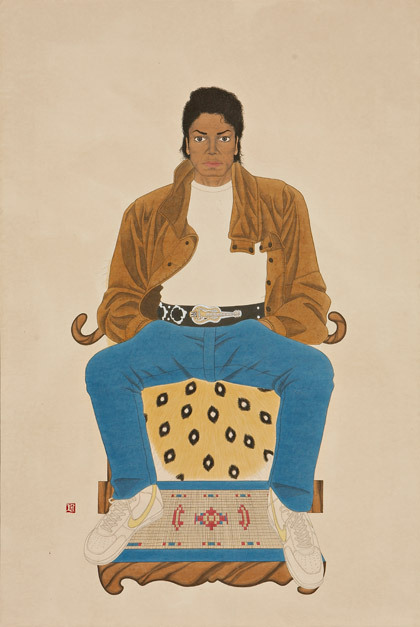 Another eye-catching object in his work is the chair Jackson is seated on. 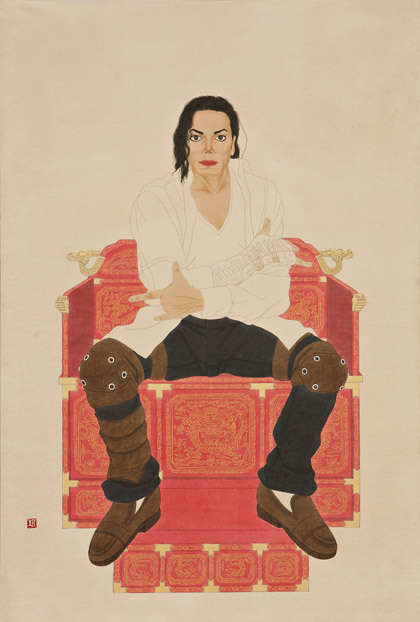 Michael Jackson in his work sits on a chair in costumes and poses we probably saw on his music albums or in videos. 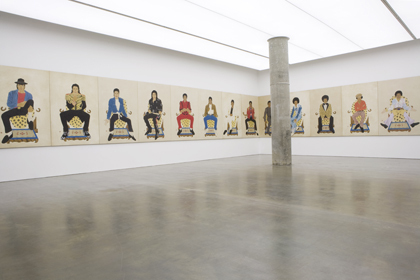 Classified into two styles, the chairs stand for a turning point in which Jackson referred to himself as a king. 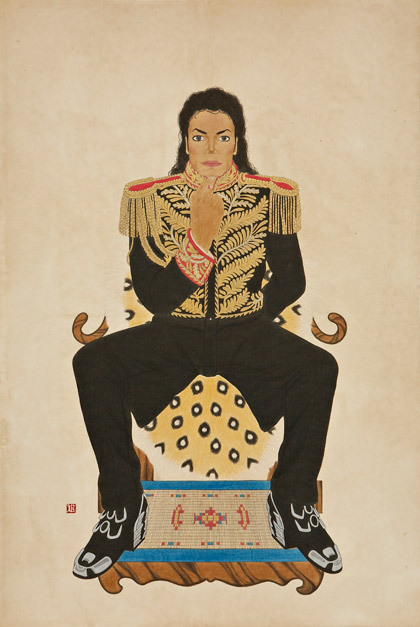 Since then, his stage action and costumes gradually became more authoritative, as if to show the dignity of a king. 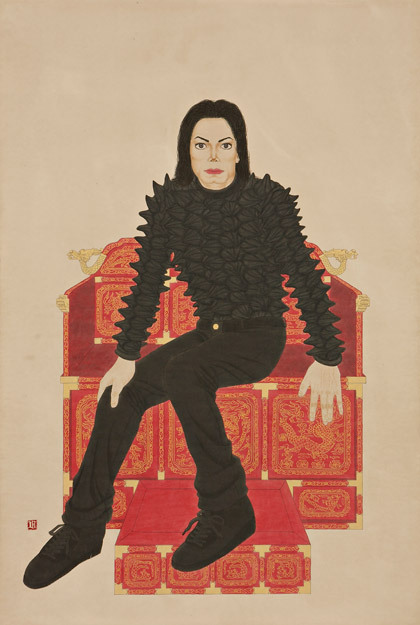 In Son’s portraits Michael Jackson before 1989 was seated on a chair with a tiger-skin cushion while his appearance after 1989 was seated on a red royal chair. 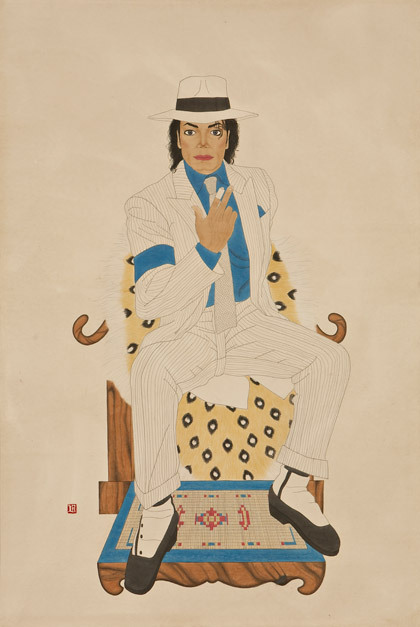 Upon closer examination, Michael Jackson whose skin is still dark sits on a chair with stripes in a slanted position. 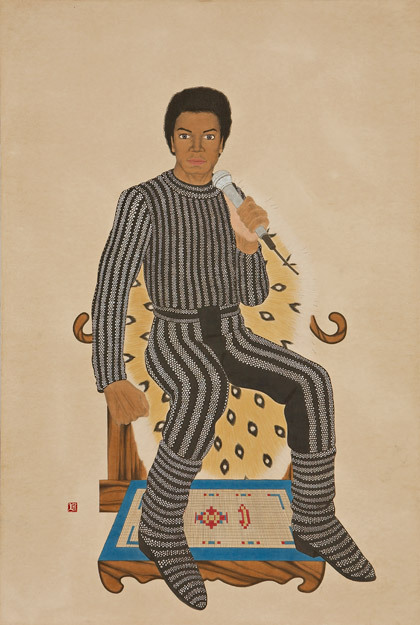 He seems to sing a song over the microphone or sits in a dignified mien with his arms folded. 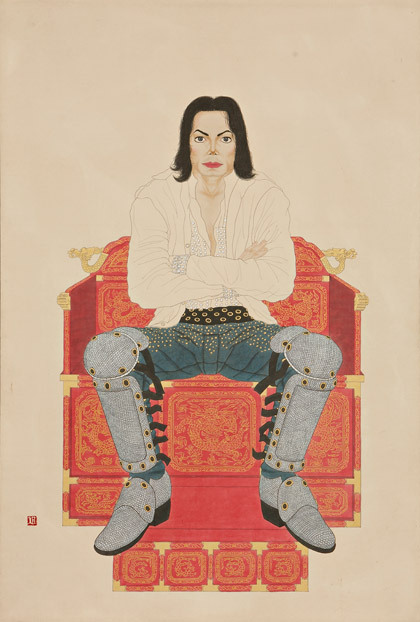 After he became a king, Jackson whose skin completely changed into that of a white man sits on a king’s chair with golden details on a red background in a supremely confident attitude. 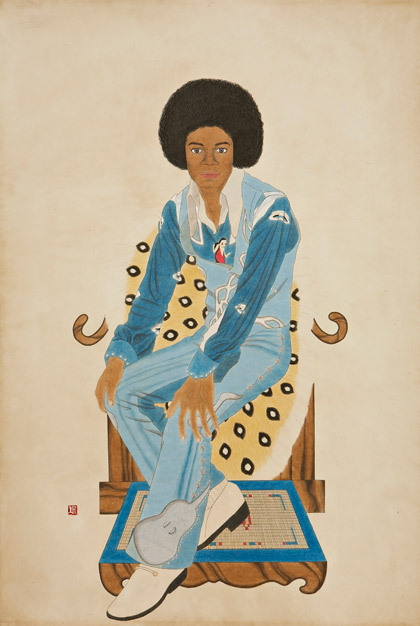 Entering the gallery, viewers may experience a time travel going back to Michael Jackson’s childhood days when he debuted as a black kid from his heyday as a king or an icon of mass culture. 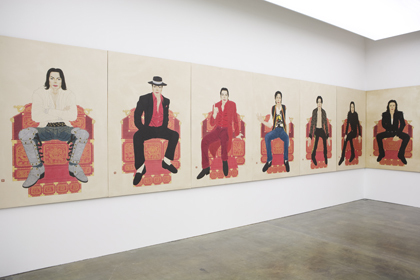 Through the images of Michael Jackson who was considered a great king of mass culture and discarded by the public, Donghyun Son provides viewers with an opportunity to think over once again a wide variety of issues and feelings we face in our times.